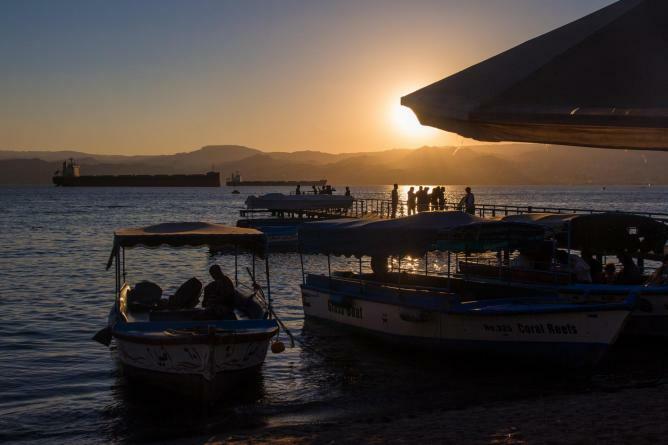 Once a small fishing village home to an ancient Ottoman fortress, Aqaba is Jordan’s only coastal city, and thus holds a great allure for tourists wishing to experience authentic Middle Eastern life amid the backdrop of golden beaches. With a history dating back to 40000 BC, and a dynamic contemporary culture which welcomes visitors from all over the world, there is a lot to experience in this thriving, beautiful seaside resort. Here’s our definitive guide to the 10 best things to do and see in Aqaba, Jordan. Named after Hussein Bin Ali, the Emir and Grand Sherif of Mecca from 1908 to 1917, and the man who pioneered the Arab revolt against Ottoman rule during the First World War, the locals see this stunning mosque as a symbol of the strength and power of the Arab world and its people. With its pristine whiteness, intricate glass windows and soaring minarets, the mosque is a beacon of Islamic architecture and a moving sight among the hustle and bustle of the beach and city center. 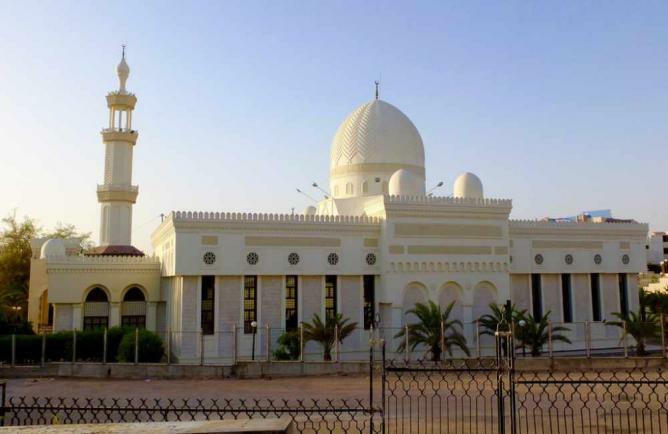 The main mosque for Aqaba’s citizens, visitors can quietly stroll around the elegant interior and witness the city’s daily life at its most tranquil and pious. Best seen at night, at this time the mosque is beautifully lit up and viewable from miles away, making it a citywide institution. Sharif Hussein Bin Ali Mosque, Al Malik Hussein Street, Aqaba, Jordan. 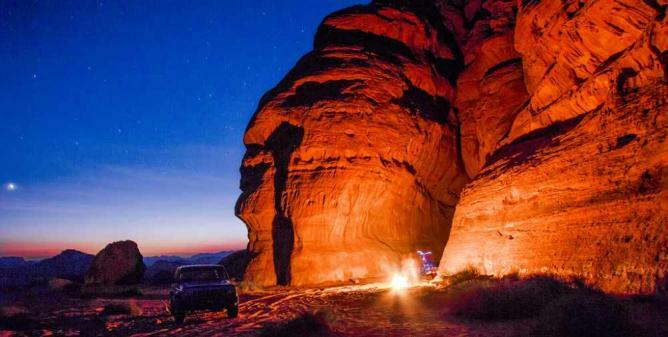 Inhabited by bedouins and ancient civilizations since prehistoric times, the Wadi Rum desert is an absolute must-see whilst in Aqaba. Also known as the Valley of the Moon because of its unique topography, an arrangement which resembles the canyons and craters of the moon’s surface, the desert is an awe-inspiring site of sandstone and granite rock formations dating back millions of years. Sprawling over an expanse of 278 square miles, those visiting can see a number of both natural and man-made sites, including the colossal ‘seven pillars’ rock formation and the Thamudic inscriptions, words which were carved into the rocks as early as the fourth century BC. Not only is the desert a haven for archaeology and history buffs, it also exudes an ethereal atmosphere, and is a place where visitors can feel a sublime sense of generations past. With many jeep tours operating from the city, exploring the Wadi Rum Desert is an easy, entertaining and deeply effecting day out. Be sure to take a look at night too, when the stunning stars are out in full force. Wadi Rum, Aqaba Special Economic Zone, Aqaba, Jordan. The Aqaba Archeological museum is located in Aqaba old city, and is set in a rustic stone building which in itself is historically significant. Built in 1917, the museum was initially intended to be the palace of Sharif Hussein Bin Ali himself, and retains the sense of luxury and grandeur fit for such a celebrated figure in Islamic culture. Housing a number of compelling exhibits, fascinating artifacts which tell the story of Aqaba’s history as an important seaport, visitors here can view collections from the Umayyad, Abbasid, Fatimid and Ayyubud periods. Exhibitions are held often, presenting golden Jordanian dinars used during these periods as well as various pieces of pottery, jewelry and stone sculptures excavated in the local area. The Aqaba Archeological Museum, West of King Hussein St, Aqaba, Jordan. Leaving the Middle East without experiencing a traditional Arab marketplace would be a serious cultural faux-pas, and there is no better place to soak up the lively atmosphere of the ‘souk’ than in Aqaba. A stretch of charming, ramshackle shops and stalls snake through the old town here, offering everything a visitor could dream of, from buckets full of local herbs and spices, to colorful stained-glass lamps and hookah pipes, all sold at unbelievably low prices. 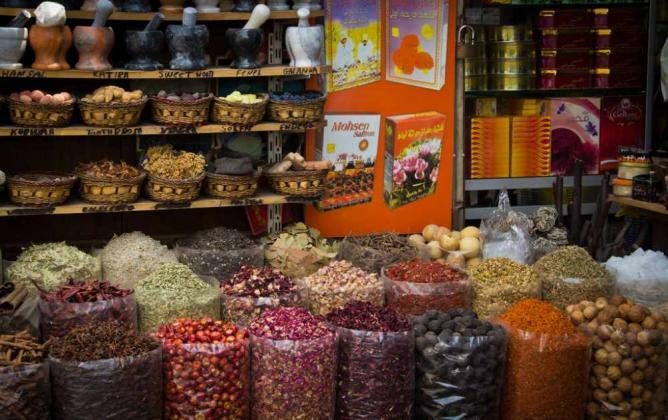 Whether out shopping for vegetables or picking up some clothing bargains, visitors can experience the loud and rambunctious atmosphere of an authentic Arab market here and truly feel like they are part of Aqaba city life. Be sure to haggle with vendors as prices can be massively raised for tourists, with the local people never buying until they have at least slightly lowered the original price offered. Constructed around 650 AD, the ancient town of Ayla was the first Islamic city built outside of the Arabian peninsula, and is today a prime example of early Islamic architecture. Located in what is today the center of present-day Aqaba, the city was inhabited primarily during 7th-11th centuries before being destroyed by a series of natural disasters, Bedouin raids and Crusader attacks. Lying untouched for thousands of years, the remains of Ayla were discovered in 1986 during an excavation by the University of Chicago, and is thus a fairly recent archaeological attraction. Exhibiting a number of interesting things, including marketplaces, city gates and tribal quarters, one of the most important structures in the excavated site is its mosque, a large congregational structure which has been used to enhance progress in Islamic studies. With signs placed around the site offering information for interested explorers, Ayla provides a captivating attraction for visitors wandering around the center of Aqaba. Souk by the Sea is an evening street market held every Friday in downtown Aqaba. Established by World Associates, a non-profit development organisation which offers support, educational programs and leadership training to the people of Jordan, the souk aims to create opportunities for local artisans to showcase their products and set up their own small businesses. From hand-made sand bottles, bags and jewelry, to cross-stitching and clothing, visitors at the market can pick up some authentic and well-made Jordanian products whilst supporting a local cause. With World Associates providing informal business coaching to vendors on marketing and pricing, guests can expect a helpful and friendly service which is well priced, and is without the usual tourist trickery. With a number of food stalls lining the market, and live entertainment provided by local musicians, the Souk by the Sea is a night out in itself, and is a worthwhile event to get involved in. Every February Aqaba plays host to this large and vivacious festival, an event celebrating the culture of the Bedouin people who have inhabited the surrounding desert area for thousands of years. In the past, the Bedouin were tribal people who moved from place to place in the rocky sands of the Middle Eastern deserts, searching for water resources and herding livestock such as goats and camels. Their culture was one characterized by song, dance, poetry and instrumental music, with the poet being placed at the top of the social hierarchy, and groups of nomads gathering together at night to indulge in artistic performances. The Aqaba Traditional Arts Festival is a celebration of these historic traditions, created to preserve the customs of the Bedouin people as they increasingly abandon their nomadic lifestyles and create more urbanized environments in which to live. Visitors to the festival can wander around stalls which sell bedouin handicrafts, goods made using techniques passed down through generations. The event also sees lots of performances taking place, from sword dancing to poetry recitals. 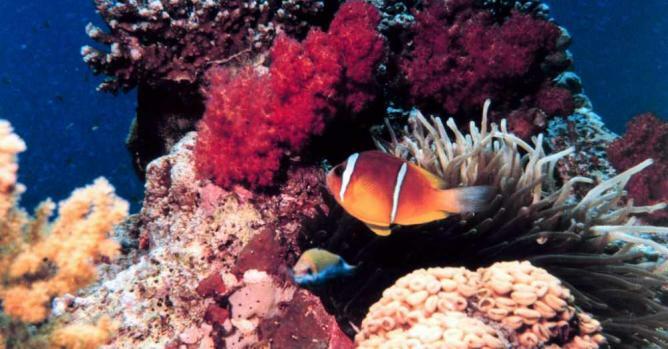 Renowned worldwide for its diverse ecosystem and marine life, the Aqaba reef is home to over 240 hard and soft coral species and 1000 species of fish, as well as a vast selection of critters and invertebrates, from hawksbill turtles to stingrays and snappers. With a number of dive sites stretching all across the coast, each with their own distinct characteristics and specimens, experienced divers will not be disappointed with the underwater diversity on show here. Beginners can also benefit from the clear, calm water conditions, and the swift entry and exit procedures of the sites. There are a number of dive schools offering lessons in Aqaba, top picks including Aqaba Adventure Divers or Dive Aqaba, both 5 star PADI dive centers with experienced professionals leading fun and interesting underwater adventures. For those not wishing to stray too deep in the water, both organisations offer snorkeling tours and glass bottomed boat tours, two wonderful opportunities to witness the local sealife. Also known as Aqaba castle, this impressive stone fortress was built in the early 16th century. A pillar for local commerce which functions simultaneously as an inn for pilgrims travelling to Mecca, the Aqaba Fort is an iconic image of the city. After the Ottomans invaded Aqaba, the castle was used to watch out for invaders in a bid to protect the empire’s wealth and power. The castle experienced another change of power during the Arab revolt which began in 1916, when nationalists from across the Middle East fought against their Ottoman rulers to create a singular unified Arab state. In a daring battle which took place on the 6th of July 1917, the Arab nationalists overcame the castle’s Ottoman stronghold in an audacious camel charge, led by the Howeitat leader Auda ibu Tayi. Today the building is an important historical and archaeological sight inspiring pride in the local people, and is a beguiling place in which to spend a day reminiscing over the city’s epic past. 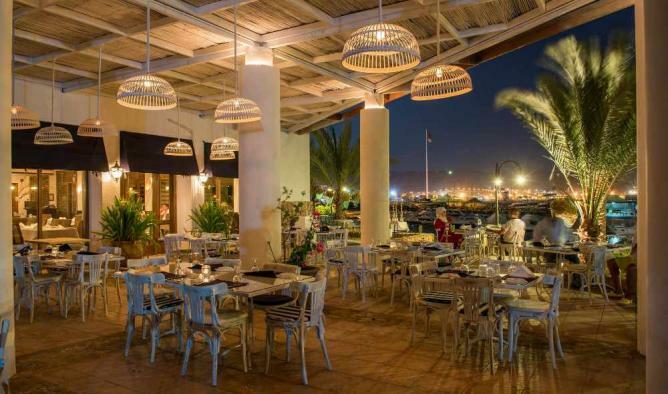 For weary tourists tired from hours of exploring Aqaba’s exciting attractions, the restaurant at The Royal Yacht Club of Jordan Restaurant is one of the best places to eat in the city, and is a beautiful spot in which to recline and enjoy a first-class meal in stunning surroundings. Upmarket and gracefully decorated, with a beautiful modern terrace overlooking the Aqaba port, this restaurant is the perfect Red Sea relaxation point serving freshly caught local seafood from the port itself. With an extensive menu combining Oriental, Italian and Asian fare to create a delicious fusion of international flavors, guests can enjoy some of the restaurant’s signature mussels cooked in a light butter sauce, or even some Japanese-style sushi, whilst overlooking the glittering yachts on the harbor. Stylish and luxurious, and boasting one of the best locations and views in the city, this restaurant is a beacon of culinary prestige in Aqaba.